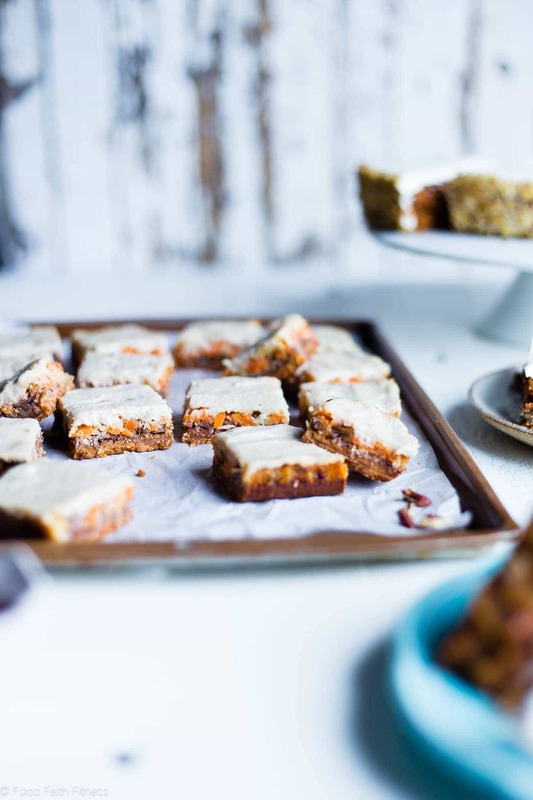 These easy carrot cake paleo magic cookie bars taste like the real thing, except in gluten, grain and dairy free form – complete with frosting! They’re a vegan friendly, healthy dessert for Easter! CARROT CAKE WEEK DAY 2. IT’S HEREEEEEE. On Monday’s Vegan Carrot Cake Dip with Spice Chips I told you about the impromptu-totally-not-planned-but-apparently-my-inner-soul-CRAVES-carrot-cake week of carrot-cake themed goodies that we are having. Usually, I think it’s some kind of “food blogger faux pas” to share 3 recipes with the same flavor profiles back-to-back. But, when we’re talking SPICY! SWEET! DELICIOUS AND NUTRITIOUS (hi hidden vegetables!) then I think we can all agree that back-to-back in BASICALLY the only logical option in our thinking brains. 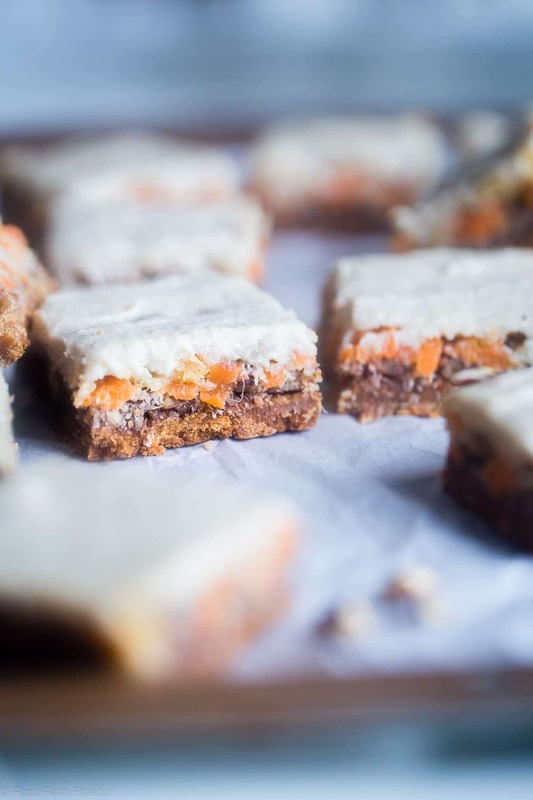 The fact that your eyeballs are peeping gluten free carrot cake magic bars WITHOUT any gluten, grain, dairy, refined sugar, but WITH vegetables that still taste, liiike, SO GOOD inside your magic-cookie-bar-loving mouth, REALLY should be about negative eleventy billion surprise to you. 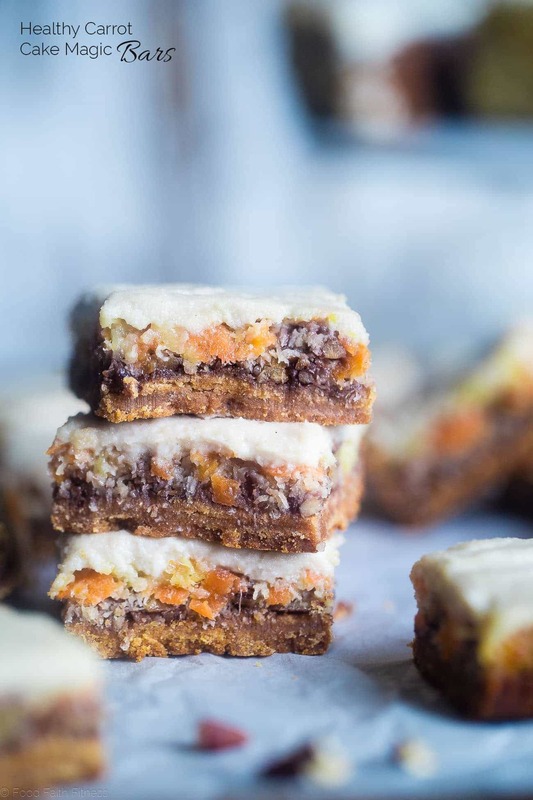 Once the standard paleo magic cookie bars broke the internet, I’ve been throwing re-makes like pumpkin spice paleo magic cookie bars and chocolate magic cookie bars with strawberry into your mouth left, right and center! In the summer, we even got really crazy and ate tropical paleo magic cookie bars! 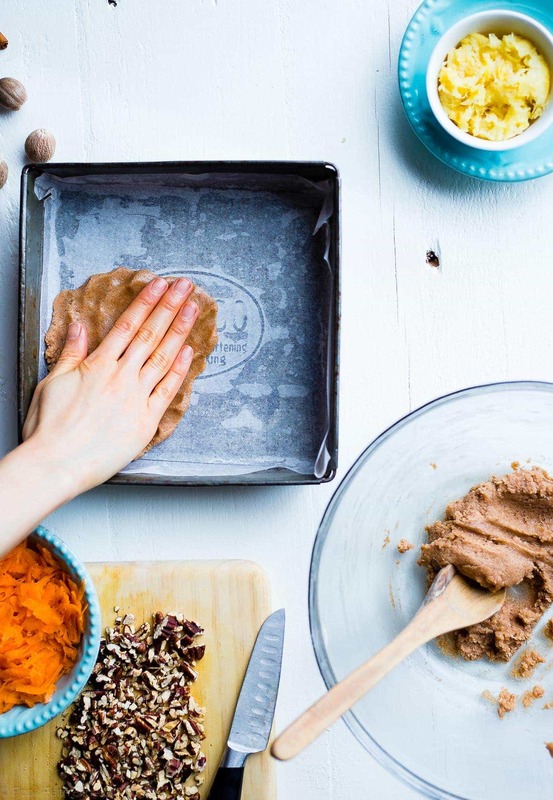 Then there were the christmas-y gingersnap chocolate paleo magic cookie bars! Considering your hungry mouth keeps catching them, I don’t think you’re mad about it ONE. LITTLE. BITE. Even though were not eating pillowy soft TRU slices of cake, these cookie bars are hitting a MAJOR home-run in the sense that they possess ALL the mandatory flavor notes of the highest quality of TRU-cake-like YUM. The crispy crust is swirling with spicy notes of cinnamon and nutmeg, that warm the back of your throat as each bite of bliss enters your VERY SOUL. <– not an overexaggeration. T-H-E-N, your taste buds tingle ALL THE WAY down to your tippy toes as the layers (5 of them!!!) 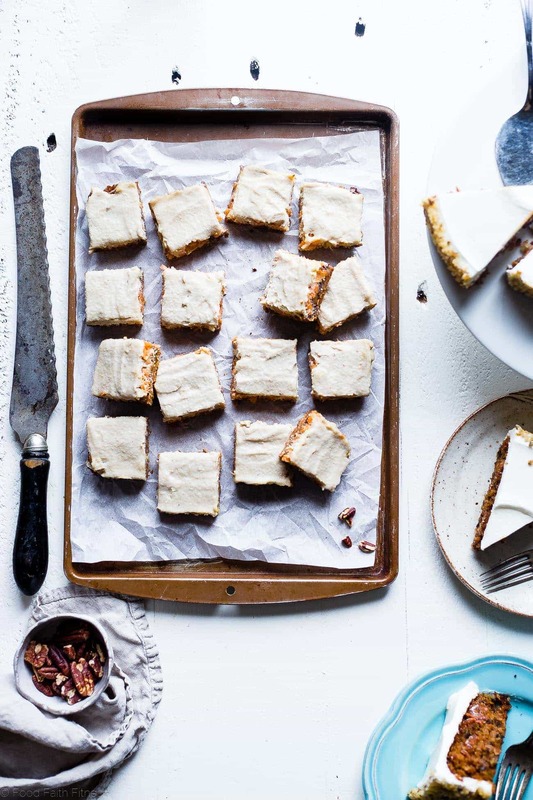 of crunchy pecans mish-mash with JUICY bursts of sweet pineapple, golden-brown toasty coconut, healthy and nutrition PACKED carrot (THE OBVIOUS MUST) and that ooey-gooey, thick and creamy coconut milk sauce that is taking these bars from something that you really want to eat –> something you HAVE to eat so that no one experiences carrot-cake-bar-craving-HANGRY you. OH MY GOSH GUYS. Did not even tell you about the fact that we have “cream cheese frosting.” LIIIKE, without cream cheese. Cashew cream is basically the savior of your dairy-free souls. It can make healthy broccoli salad or berry cashew cream no bake bars and we are now discovering it even tastes like cream cheese frosting. <– !!! Add a little agave and coconut oil to sweeten-it-thicken-it-up, give it a little time to CHILLAX in the refrigerator, and then JUST TRY to not DRINK it down before spreading it on spicy, sweet, crispy, crunchy magic bars. I HAVE tried making these without the frosting (I know, what was I thinking?) and they are still good. 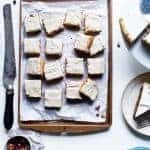 But, you would be doing your carrot-cake-loving soul a MAJOR disservice, of the worst kind, if you decided to nix it in the name of saving steps, or something ridiculous like that. Creamy dreamy frosting + crunchy, spicy crust + F-I-V-E layers of goodness = TRIPLE THREAT for your taste buds. 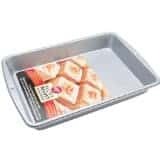 Preheat your oven to 350 degrees and line an 8x8 inch pan with parchment paper, leaving a little overhand to use as a handle one the bars are baked. I like the rub the pan with coconut oil to help the parchment stick. Place the pecans on a small baking sheet, and the coconut flakes on a separate baking sheet. Place into the oven and bake until golden brown and toasted, about 10-12 minutes for the pecans and 2-4 minutes for the coconut. Coconut burns quickly, so keep an eye on it! In a LARGE pot (coconut milk rises when heated A LOT) whisk together the coconut milk, honey and pineapple juice and bring to a boil over high heat. 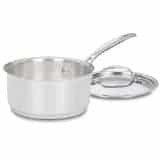 Once boiling, boil for 1 minute, stirring constantly. Then, reduce the heat to medium and simmer, stirring frequently until the sauce reduces to a total of 1 cup, about 18-20 minutes. I recommend checking it at about 16 minutes (you'll need to pour it out the pot into a measuring up) and if you still have over 1 cup, add it back to the pot and cook a few more minutes. It's important to reduce to 1 cup. While the sauce reduces, in a large bowl, using an electric hand mixer, beat the coconut oil with the 3 Tbsp of honey until smooth and creamy. Stir in the flour, cinnamon, nutmeg and pinch of salt until a wet dough forms. Press the dough evenly into the bottom of the pan. This will be a little bit tough, just be patient with it. I found it easiest to use the palms of my hands, and rinse them off every so often, until the dough was pressed in. Do not bake the crust until the sauce finishes reducing, as this allows the sauce the thicken and cool while the crust bakes. While you wait for the sauce to finish reducing, chop the toasted pecans and set aside. Additionally, place the grated carrot and and the crushed pineapple into separate kitchen towels and ring out the excess moisture. This is important, or your bars will not set as the water will be released when cooking. Once the sauce has reduced to one cup, set aside to cool while you bake the crust. Place the ready-to-go crust into the oven and cook for 8 minutes. When the crust comes out of the oven, it may have risen in some spots. Take a small spoon and gently press it all back down, being sure not to leave cracks in the crust. Sprinkle the chopped nuts on top, and lightly press them into the crust. Then, sprinkle on the coconut flakes, followed by the grated carrots and then finally the pineapple. Be sure to spread everything out evenly. Finally, pour the coconut milk sauce evenly over top of everything, making sure you get it down the sides of the bars (but not between the parchment and the pan!) Use a knife to swirl around the layers in a few spots where the sauce pools, to make sure it seeps down into all the layers (don't cut the crust!) Then, gently shake around the pan to ensure the sauce really sinks in everywhere. Place back into the oven and cook until golden brown and bubbly, about 28-30 minutes. Let cool on the counter to room temperature. While the bars cook, drain the cashews and place them into a SMALL food processor (mine is 3 cups.) Add in the milk, honey, vanilla and salt and blend, scraping down the sides as necessary, until smooth and creamy. This could take a good 3-4 minutes. 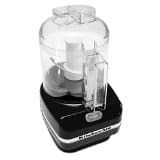 With the food processor running, stream in the coconut oil until well combined. Transfer the frosting to a bowl and place in the refrigerator to firm up. The next day, lift the bars out of the pan, slice and DEVOUR! ** DO NOT skip the overnight chilling, or your crust won't be firm and the coconut milk sauce won't firm up. *** Total time does not including chilling overnight! Oh no! You didn’t! You just made one of my top favorite cakes into magic cookie bars? You are magic!! !…and my new best friend. Something about food is so bonding, I know you understand. Anyway, back to the magic, I am on a special diet right now called GAPS and it is so hard to find desserts that, well, taste good. I think you just saved my I’m-so-miserable-I-can’t-eat-ANYTHING Easter. I SOOOO understand girlfriend!! I am so glad you like these bars and that I saved your easter! YES. Hope you love!! These look heavenly. Its spring, everyones happy to see the flowers and warmer weather, they don’t care about all the carrot . Haha, you can never have to many carrot desserts anyway. RIGHT! Carrots do NOT get the love they deserve!! Haha thank you friend! love the new blog name! Ummmmm these look INSANE! I love magic bars. I love carrot cake. I LOVE healthy things that taste good! And I’m totally fine with recipes that have the same flavor profile :). So, I am gluten and dairy free due to health issues and try to make things that way when my husband and 3 kids eat with me, but my son is allergic to tree nuts, specifically cashews and pistachios. I find myself getting so excited at creamy recipes I miss, and having to delete them when I see the word cashew. We don’t keep them in the house as he is 3 and has no grasp of his allergy yet. Is there anything else out there that works like the cashew does to make creamy things I miss SO much? I am SO sorry to hear this! Unfortunately, cashew really is the only thing that works. However, I have made these without the cashew cream and they are still really good! Not AS good…but still super yummy! Not sure if he can have the pecans in the actual bars? Wholly Guacamole do these bars look amazing! 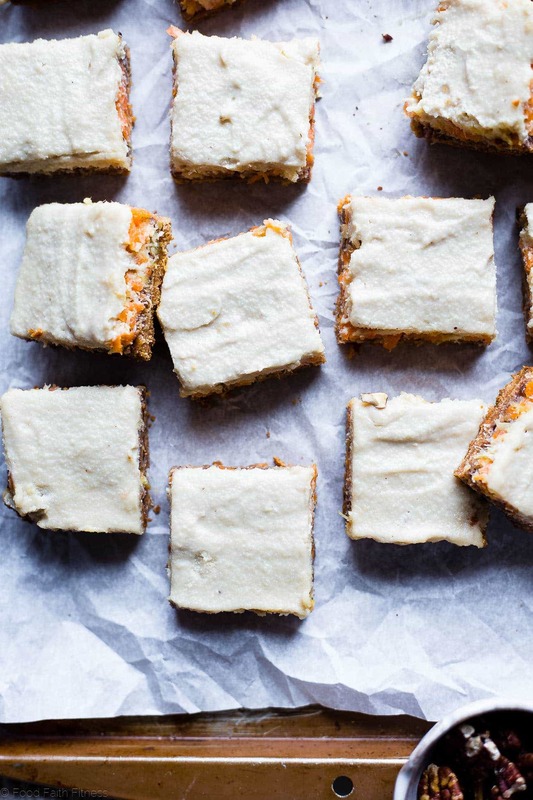 Magic Cookie Bars are one of my favorite things, and SO IS CARROT CAKE! Mind blown! Delicious! Well then you NEED these! Thanks Patricia! Wow, yummy! Tofu is one of my favorite. It so colorful. I’ll be trying this one soon! Nothing better than sneaking in some healthy veggies in dessert! There’s always cauliflower cupcakes, kale brownies, zucchini muffins, and sweet potato donuts too! Love the look of these bars. I bet they are magic! I couldn’t agree more! Thanks Cassie! These look awesome!! My daughter can’t have pineapple. Any ideas for a sub? Thank you!! You could just leave it out??? It will still taste good! When I made these bars and they fell apart. It is way too crumbly. It taste like it should have been mixed up together, not layered. Also, the frosting icing did not turn out anything like yours. It was more of a crumble topping. I followed the recipe completely. No impressed. I am sorry you had problems with them! 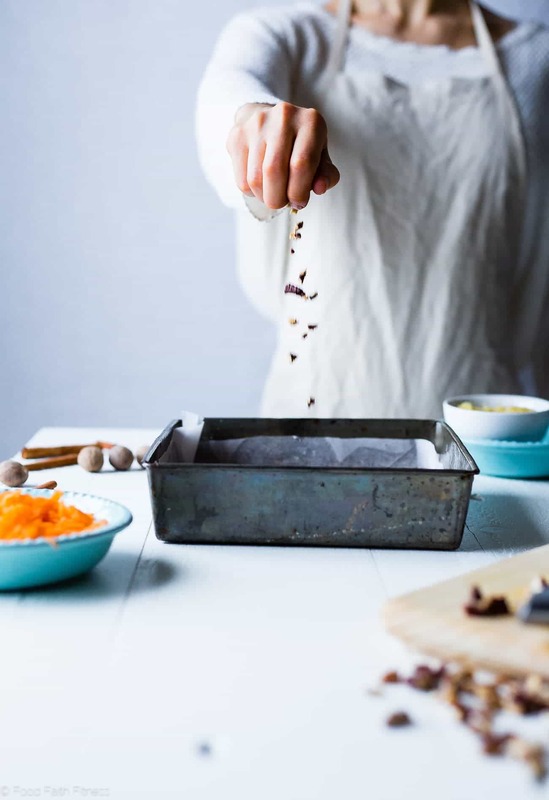 Did you weigh your flour for the crust, it sounds like you may have used too much and/or baked them too long, and/or didn’t put the toppings on right after the crust came out of the oven – you do need to work quickly! Did you use a small food processor for the topping? That is key, or the cashes don’t go smooth. I know for sure that my boys will love this for the weekend. Thanks for sharing. 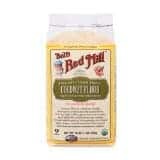 My hubby is not supposed to have coconut, so will almond or oat flour work? It won’t I’m sorry! They are much different than coconut and nothing is interchangeable for coconut!